To Tag files there are three ways to go about it. Get in touch, we will be able to help you with if you. In the Admin interface, click Assets > Manage Approved Tags. In the right top part of the screen you will click the + Approved Tag button to add additional Approved Tags. A modal window will appear. You can enter one or more new Tags at a time. Seperate each Tag with a comma's or a click the Tab key. Tags can be multi-word and use Capitalisation if necessary e.g. AI. Click Create to save the Tags to the Approved Tags list. You can also Delete and rename Tags on this screen, as well as View the Assets belonging to each Tag. Tag multiple assets from a Basket selection. In the Admin interface, navigate to the Assets grid and search for the Assets you would like to Tag, and add them to your Basket, by Selecting them with the Select icon (circle icon), or navigate g to the asset detail page and clicking the Add to Basket button, for each Asset in your selection. 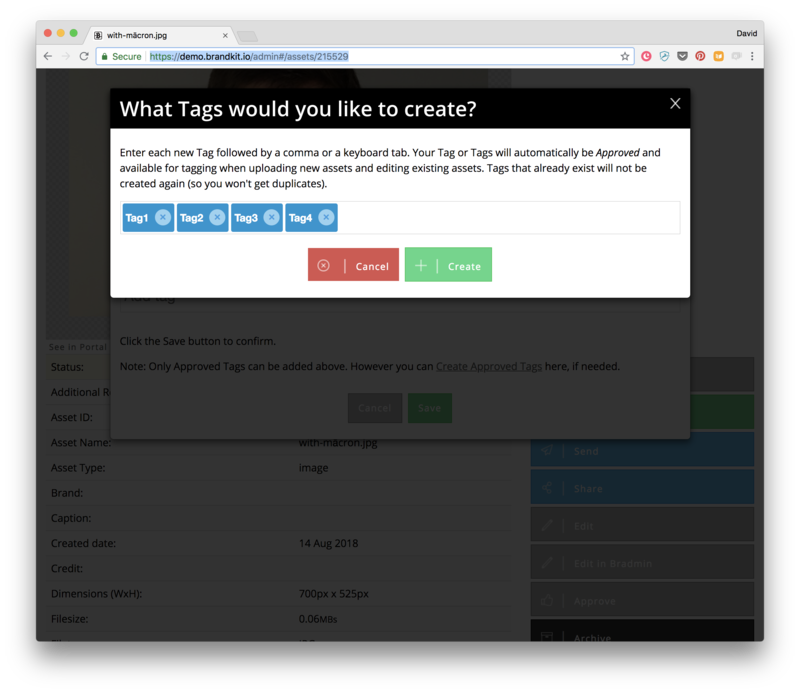 A modal window will open where you can enter your Approved Tags into the input field. A Typeahead list will display the Approved tags as you type. If a Tag you want is not available in the typeahead, you can also optionally add new tags in-situ, with the 'Create Approved Tag's link in the Add/Remove Tags modal window. Navigate to Asset Detail page of the Asset you wish to tag. Click the Add/Remove Tags button in the Action panel. You may need to close the sidebar Basket to see the Action panel. Brandkit uses AI and Machine Learning to automatically Tag images using object recognition in uploaded images. Auto-tagging is on by default for new accounts. Auto tagging can be turned off. Accuracy is tuned to 80% by default (i.e, 80% confidence the tag is accurate). Accuracy can be tuned for each account. Auto-tags are identified as Auto-tags in the Admin interface. Any Auto-tags that are unwanted can be deleted by Admins but will reappear if your rerun Autotagging on the same Assets. You can blacklist certain Tags(words) to prevent them being added to your Approved Tag List. Sometime you want to remove tags from an Asset or Delete Tags from the system altogether. Here's how. Navigate to Asset Detail page of the Asset you wish to un-tag. Click the Add/Remove Tags button in the Action panel. You may need to close the sidebar Basket to see the Action panel. A modal window will open where you can view the Tags already applied to the Asset. Just click the 'X' icon to remove the tag. Note that this will remove the Tag from the Asset, but won't impact other similarly tagged Assets or delete the Tag from the Approved Tag List. Scroll down the page or use Search to find the Tag you wish to Delete. Check the tagged Assets, by clicking the View button for the Tag. Once you';re sure you want to Delete the Tag. Click the Delete button in the Tag row of the Tag you wish to delete. This will Un-Tag the Assets and Delete the Tag from the system. NOTE: You can also Rename Tags (rather than Delete) if that is appropriate, bu double clicking the Tag text and retyping. Hit enter to save the change. If you're adding the same group of tags multiple times, you can save time by copying and pasting in a comma separated list of tags into the Add Tags or Create Tags box in Admin.